(This is for Slice of Life). This coming Friday, a colleague/friend/collaborator (Gail Poulin, whom some of you may know through blogging and Twitter) and I will be facilitating a session around digital storytelling via iMovie with the colleagues at our school. I won’t say I am nervous, but I will say that I know the range of technology comfort is wide among our staff, and there are probably more than a few that would rather do anything than work with technology during a PD day. We were asked to do this session by our principal and I do want to find ways to engage my colleagues with digital writing. Still, Gail and I both are aware of the trepidation among our teaching friends, and let’s be honest: iMovie is more complicated than Photostory3, but we are now a Mac school so … into iMovie we go. At yesterday’s staff meeting, as I talked about what to expect for the session (we’re going make digital stories in a hands-on session) and what to bring (Macs and images, etc. ), I also tried to broaden the expectations around discovery, fun and reflective stance. I had created this presentation in Haiku Deck to help ease some minds. Did it work? I’m not sure, and the fact that we will have a pretty large crowd on Friday for a technology session around digital storytelling means that Gail and I will be running around a bit, I am sure. But I also made clear that they will be called on to help each other, that this PD is going to be collaborative. We need one another. We’re a community of learners, too. And my final point? They are going to make a digital story during our time together, and the story can be about whatever they want (school, family, vacation, etc.) but find and work on a story that interests them and which will result in a digital video that will be something they can be proud of. Find a passion. Just like our students. Right? For the first week, I decided to “make a song.” (Karen’s suggestion was to make something in physical space and I am not sure I followed the rules, although sound waves are physical, right?) Tomorrow, I will explain the logistics of the video, in case you are curious and want to make your own. But today, I just wanted to share the Make itself. My latest post for my MiddleWeb blog — Working Draft — is now up. In it, I explore the notion of journal writing with my students, and of teacher being the writer as much as the student. It’s a messy, creative venture. It will be no surprise to readers here that I love comics, particularly comics that treat teaching, learning and writing as fodder for fun. This collection from the comic strip Foxtrot — entitled Math, Science and Unix Underpants — had me laughing up a storm through the house, even in places where the jokes were a little too geeky even for me. If you don’t read Foxtrot, by Bill Amend, the stories center on the family that includes a younger brother who is whiz at math and science and technology. He’s the kid who looks forward to that difficult math test and who hacks the family computer (the iFruit) on a regular basis. There is no connected story theme to this collection, other than plenty of guffaws around science experiments gone awry, math problems as inspiration for mayhem, and computer nerdiness galore. The comics here stretch back years, so there are some outdated jokes about outdated technology. I didn’t mind. For me, it was enough to be laughing out loud. I am actually going to photocopy a bunch of these gems for my classroom. You can even find this collection on Google Books now. How cool and nerdy is that? We explored the concept of the Learning Walk this summer with the Making Learning Connected MOOC — the idea that you walk with a camera and take images of what you see. In DS106, the term was PhotoBlitz. It’s sort of a visual Slice of Life. You pay attention with a level of detail you might not otherwise engage in. 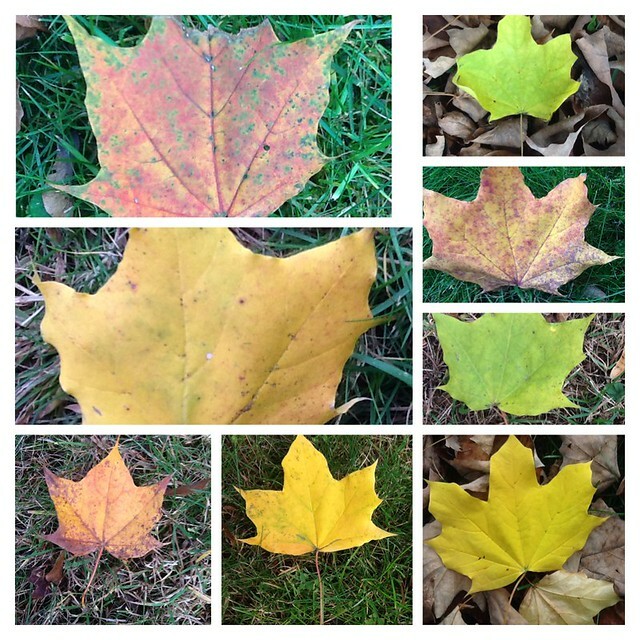 Yesterday, in my backyard, I was getting ready to rake up the leaves in my New England back yard and could not help but notice the rich beauty of color of what was on the ground. 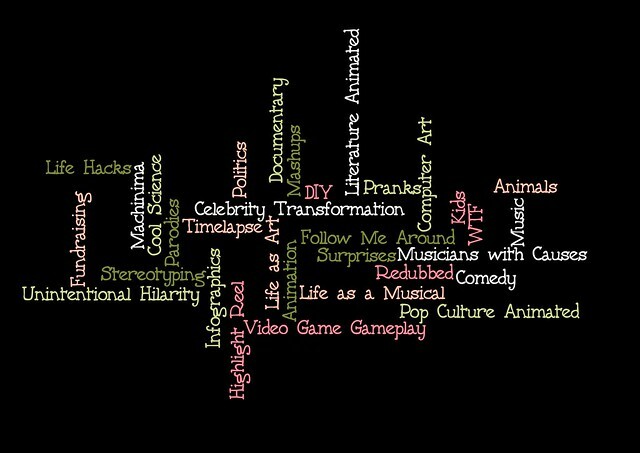 As I continue my exploration of video as text via DS106, I was intrigued by a growing collaborative document that was started in a previous DS106 group that examined the various genres of videos on YouTube. Going through the list reminded me again of how vibrant and creative people are in making videos, and how ever-widening the scope has become. And I added my own category at the end: Machinima, which is when folks take screenshot clips from favorite video games, and remix them into stories. It’s one of those video phenomenons that is huge in certain circles but often falls ways below our radar screens if you are not in the loop. In fact, it makes me wonder how many of our students are making these style of movies, publishing them to YouTube, without us (or their parents, probably) ever even knowing. I am bit behind in my DS106 assignments (I know, that’s OK) and this week’s theme is all about “reading movies” by having us analyze video clips from films. I love that they shared out Roger Ebert’s classic “How to Read a Movie” piece, which really digs deep into the contextual and compositional art of filmmaking. I have the sound off. I don’t think I need it. All of the emotion is in his face, or the lack of emotion, right? I turn the sound up and I hear him typing. Notice the long pauses? There are fewer and fewer of those in movies these days. But here, as the camera moves in closer, it has an impact. And normally, a shot of a computer? Frigging boring. But the decision around friending is a key part of this movie, and the shuttling back and forth of the lens is very effective. Music kicks in around 40 seconds, just as he leans back to reconsider what to do. Nice touch. This is the final scene, so we get an update on how it all turned out. But is he happy? Use of white space here. To represent emptiness inside of the Matrix. Lens spins, giving us and him the feeling of being disorientated. The use of lens here is important. I know a lot has been written about his sunglasses here, but as a visual symbol, they are important. The viewer leans in, half expecting to see themselves in the glasses, right? I find it interesting that the props are furniture. And notice how the television is “old school” — showing the dichotomy between the ideas and the scene, and the plot that is emerging in the movie. Short clip, mostly showing Ted Night’s arching eyebrows and wide mouth. Perfectly in tune to character. Turn off the sound, and you can still guess the tone of his language. The sarcasm drips. Not much in terms of filmmaking style but casting actors who can inhabit a character is critical for a film like Caddyshack. Not just Ted Night. Can you imagine this movie without Bill Murray? No way! This is perfect. 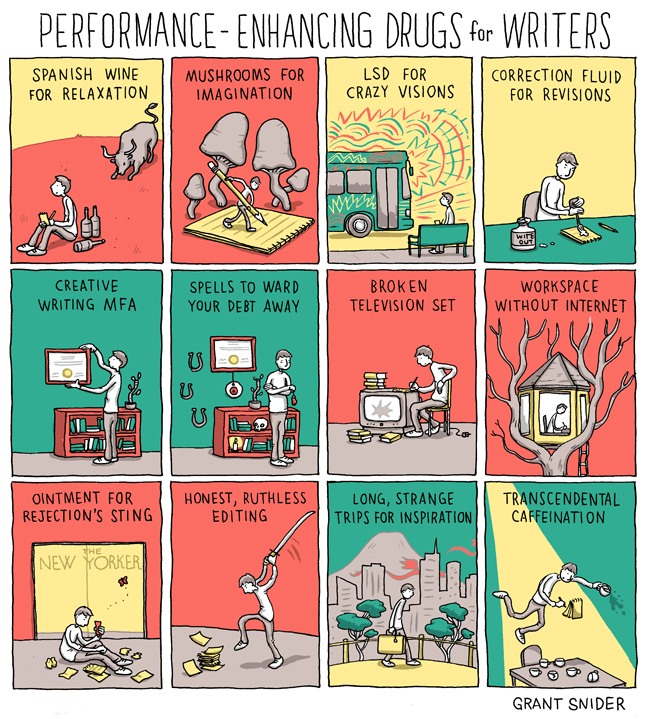 It comes from Grant Snider at Incidental Comics. This book by Mary Amato must have been written for someone like me. I am a huge sucker for novels that have a musical theme weaving into the story line, and Guitar Notes is all about the friendship between two high school students dealing with the pressures of life. 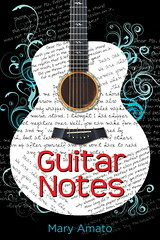 The guitar notes of the title has a double meaning — not only is it the music that Tripp and Lyla begin to write together but it is the series of notes they leave for each other in the school music room as they begin to develop a deep friendship through the story. Tripp is a sarcastic child whose mother has taken away his one treasured possession — his guitar — until he gets his grades back up. Unfortunately, he is still dealing with the loss of his father. Lyla is the perfect child, whose cello playing prowess comes from her mother, another parent who has died in the near past, leaving Lyla in the shadows of her mother’s musical legacy. A shared practice space in the music wing of their school — Tripp has the room on odd days, Lyla on even days, and he becomes Mr. Odd and she, Ms. Even — brings these two together. There is a surprising, emotional twist near the end that almost had me in tears as I was reading quietly next to my son. If you believe in the power of music to heal and connect, then read this book. If you don’t, well, read this book, too. At one point, Lyla and Tripp as talking about songwriting as a means of understanding the world. And Tripp has what he calls his Thrum Theory — that people are connected on deeper levels than they know. I mean, that is beautiful, right? I loved this book, Guitar Notes, and highly recommend it. And, the songs that Tripp and Lyla write? The lyrics are in the back of the book and Mary Amato has recorded the songs, too. Check out this video as she explains the process of writing and recording and sharing out the songs.